This article is about our new Research project: Application Coder. The application is a very simple Java Code Editor. It shows a tree with Java files and has a Code Editor for modifying files. 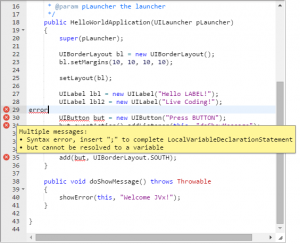 The code editor is the popular Ace Editor and we use Eclipse JDT for java compilation. The application was written as standard JVx application with vaadin UI. We made tests as single-page vaadin application, embedded with iframes and embedded with div areas. All versions work without problems but the last one is preferred. If you embedd a vaadin application with divs, it's a little bit tricky because you have to configure the client-side on your own, but you get full access to the whole html page. This wouldn't be possible if you use an iframe because you can't access the main html page. 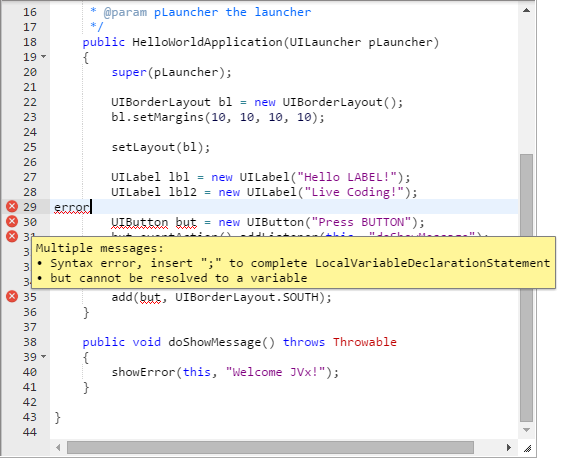 Some cool features of our editor are: error annotations and error markers. And the best feature is our LIVE Preview of code changes! The application coder is not only a Java code editor, it was designed especially for JVx applications, because it groups client code and business logic. The preview also starts a JVx application and LIVE preview reloads the application. Our coder application has a push mechanism and reloads every preview window automatically and immediate after compilation. Above video shows multiple instances of our coder application, embedded in divs and it's possible to drag around and resize the applications (thanks to jquery-ui). The application is a perfect showcase of JVx because it's not a database application as many other JVx applications. We've used vaadin, jquery-ui and vaadin-addons to create a great UX. JVx is technology independent and open for other technologies. We heavily use Eclipse AST and JDT. The problem with both APIs is that you don't find a lot of documentation or examples. The best documentation was and is the source code. It shows all secrets. * Loads the properties from the source file. //currently loaded file can not be changed! * Sets the comment for the class. * Gets the comment for the class. * Sets the full qualified name of the class. * Gets the full qualified name of the class. * Sets the full qualified class name of the parent class. * Gets the full qualified class name of the parent class. * and saves the source file. * Stores the changed source into the given file. * Stores the changed source into the given stream. * Returns the modified source code. The class contains references to other classes like CommonUtil, FileUtil, StringUtil. These classes are included in JVx. There are two classes (JavaSource, ClassUtil) that are not free, but you should find out how it works without these classes. If you'll set a new superclass, the superclass and its import, if available, will be updated. If you'll set a new classname, all constructors will be updated.